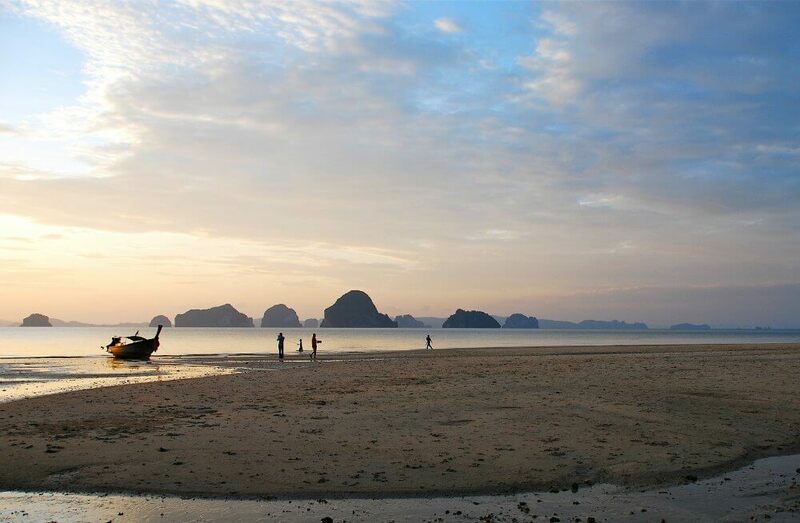 The Thai province of Krabi has 15 amazing beaches on the mainland (7 are described here). It also has 3 wonderful island groups which are world famous. Krabi Province is this writer’s favourite part of Thailand too. Many people come to the Krabi area and don’t have much idea where they are. So this blog is here to help. It has a simple map at the bottom showing the beaches and islands. 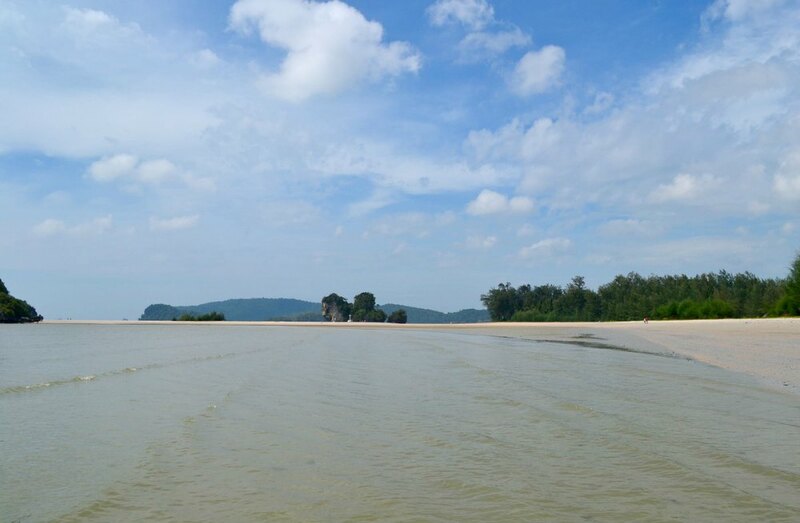 It also has a clear description of the best beach locations in Krabi Province. We start at the top of the map and work our way down the coastline. Enjoy! TubKaek beach is a quiet place about 30 minutes drive north of Aonang and a 40-minute drive from Krabi Town. The accommodations are nearly all 5-start, self-contained resorts that are right on the beach. 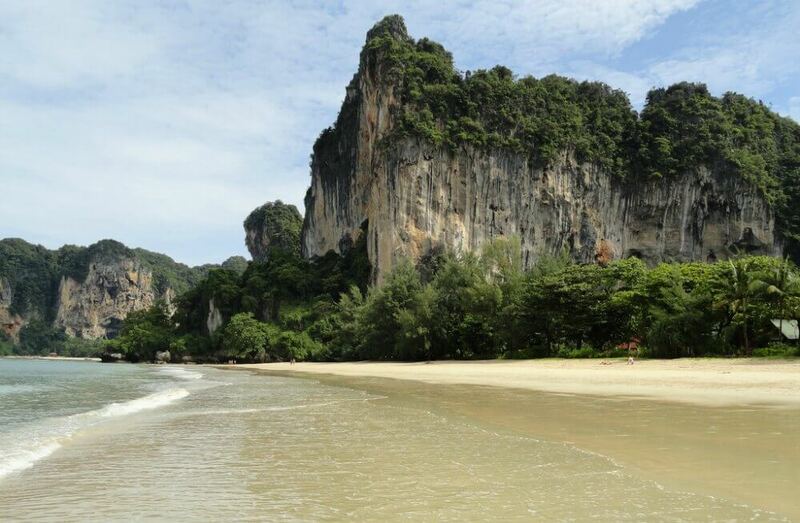 Ths makes it one of the best beach locations in Krabi Province. With restaurants, spas, and shops within the grounds, there is no need to ever leave the resort, which is lucky because there’s very little here. TubKaek is perfect for those who want a quiet, luxury break, but it is still possible to do all the local tours from here. This includes kayaking, the 4 islands tour, the hot springs, and the Tiger Cave Temple. There are also shuttle buses to Aonang so that you can go shopping and eat at restaurants there. Conversely, since there are no private beaches allowed in Thailand, and this beach is open to anyone. So if you are staying in Aonang and want a quiet day out, try TubKaek for a private beach feel. Swimming is not particularly good since the coast is quite rocky, but it is fine for swimming at high tide. There is a stunning little National Park at Tubkaek Beach where there is a forest walk to a waterfall and you can continue further to the peak of a mountain with amazing views. The mountain trek takes 2 – 3 hours but is well worth it if you are fit and healthy. This is called Khao Ngon Nak (Dragon Crest Mountain) and is a superb experience. And did you know that this was the beach used for filming the wedding in Hangover 2? Less than 1km south of TubKaek Beach is Klong Muang Beach. This is my least favourite beach of Krabi Province because there is a quarry at the top end and so the little road running through the area has lots of lorries travelling back and forth. You won’t notice this if you stay in your resort, which will most likely be a self-contained 5-star resort, but if you wander around the little village it will become apparent. 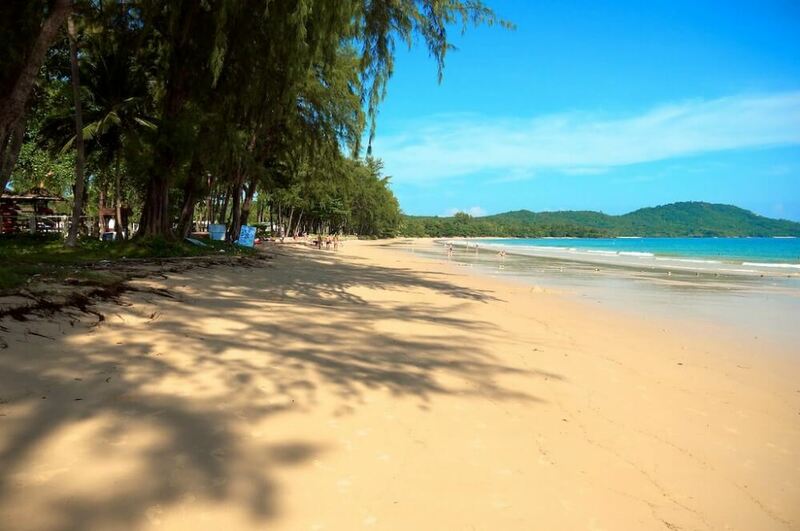 Klong Muang Beach does have stunning views and lovely sunsets and this beach is strewn with excellent resorts such as The Sheraton and Sofitel. There is more of a village atmosphere here than TubKaek, but again, come here if you want peace and tranquility in a luxury setting. 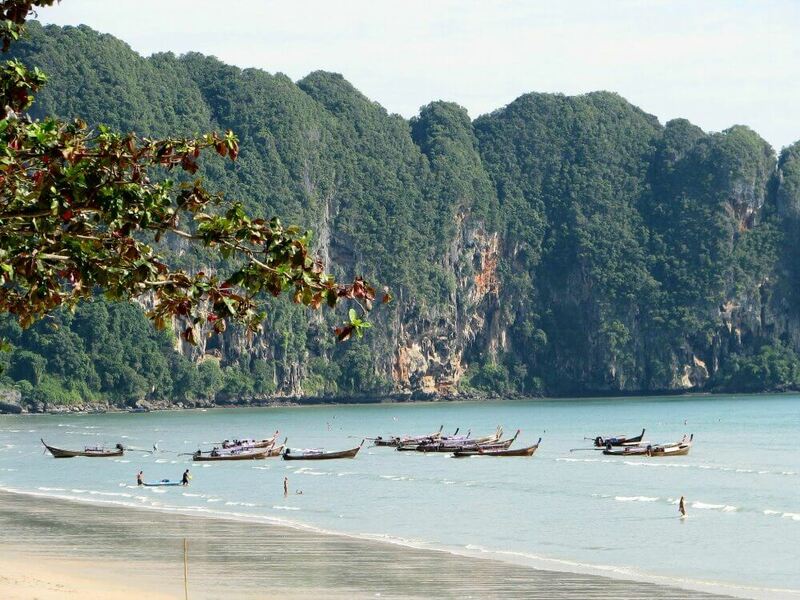 Noppharat Thara is a 5km long sandy beach, which you can walk to from Aonang Beach. It is split into two halves by a river. The side closest to Aonang is the most developed because it has the coastal road running alongside it. Access to the other half of the beac is by longtail boat or by a dirt track off the Klong Muang road and is very secluded as a location. The main beach itself has very few resorts and is a favourite of Thais who come here to sit under the trees with a picnic, but there are plenty of guesthouses in the village nearby which is a good location for long-stay travellers and budget-conscious expats. Noppharat Thara beach is wonderful for walking at low tide and has lovely sunsets too. There are also some really good local seafood restaurants here. Nopparat Thara Beach is 18km from Krabi Town and 28km from the airport and is a 2 minutes drive from Ao Nang or a nice walk. In high season there are tourist ferry connections from Noppharat Thara Pier to the islands of Phi Phi, Lanta and Phuket and you can also arrange all the longtail day trips from here too. Ao Nang is the centre of the tourist scene on the Krabi mainland, with lots of hustle and bustle near the main beachfront road, You’ll find souvenir shops, clothing shops, art galleries, spas, tour agents, and ATM machines along this stretch, as well as restaurants, bars and a huge range of hotels, some of which are really lovely despite Aonang being developed quickly and without much planning. The quietest and prettiest part of the beach is beyond where the longtail boats dock, it is a lovely strip with a beautiful steep cliff as a backdrop and is great for swimming all year round. The view across the whole 3km wide beach is stunning especially at sunset, in fact it is one of the best sunset locations on Thailand. Despite it being a busy resort town, you won’t find the beach clogged up with hawkers and jet skis like you do in Phuket, and despite all the hustle and bustle, the area remains friendly and safe. The tourists in Ao Nang are mixed; it is family friendly but there is also a small area of bars that are hosted by bar girls. Aonang also has a vibrant live music scene that plays until 1am. As mentioned in earlier sections, many people stay here or even in nearby Krabi Town to make use of the cheaper accommodation and then set off each day to see other, more exotic/secluded locations, such as the 4 island tour and The Railay Peninsula. If you find the main strip of Aonang a little mediocre, there are some gems to be found nestled in the hills behind, such as The Hilltop Restaurant which is a stunning location and excellent food. There are also sunset cruises and booze cruises run from Aonang which are enjoyable too. 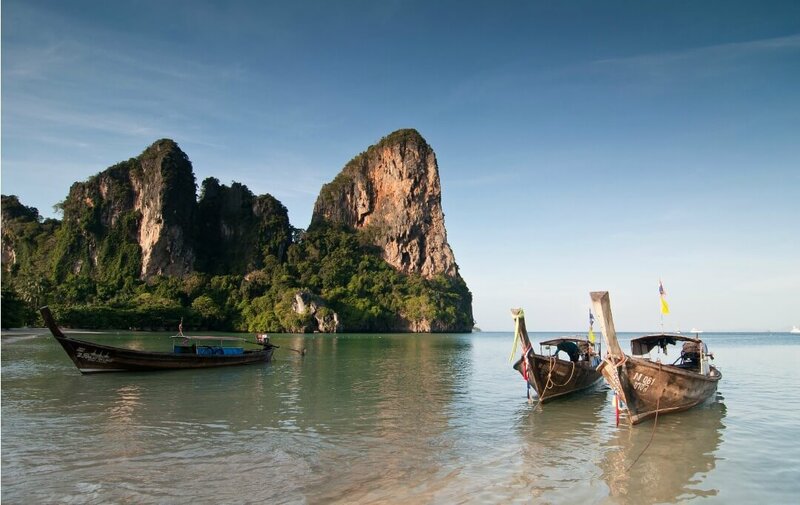 No list of the best beach locations in Krabi province is complete without Railay. Railay is a beautiful peninsula between Krabi Town and Ao Nang, on the mainland, however, you can only get to it by boat due to high cliffs cutting off access. It’s only 15 minutes from the mainland by boat, but once you arrive you feel very secluded. This area is extremely beautiful and increasingly expensive, however, you can find some cheapish accommodation and some really fun nightlife too. Accommodation ranges from fan aired bungalows on Tonsai Beach, 2, 3 and 4-star resorts at East Railay, many amazing 4 and 5-star resorts on West Railay, plus the infamous 5* resort called Rayawadee. There are three beaches on the peninsula, Tonsai, still with its hippy vibe and home of many rock climbers, Railay West, one of the most beautiful beaches in the world and Phra Nang Beach, also totally beautiful. Railay East is also a beach of sorts but is full of rocks, mangroves and boats so isn’t suitable for swimming. This area has some really cool bars and great seafood restaurants though. Be aware that you are in a tourist area on the Railay Peninsula so everything will be more expensive than the mainland, but it really is one of the best beach locations in Krabi Province, in fact probably THE best! It is possible to come here for a day trip if you want since it is only 15 minutes by boat and costs less than 100 baht each way. It is possible to walk between all beaches in less than 20 minutes, although getting to Tonsai from Railay takes a bit of effort. In high season (November-May) you can take a boat to the Railay Peninsula from Ao Nang Beach, Krabi Town or a little pier in the village of Ao Nammao. In low season very few boats go from Ao Nang Beach. At Tonsai Beach there are 3 main three draws: the world-class climbing opportunities, the secluded location and the laid back chilled bars playing old school reggae. This is the place you come, to learn the art of reclining and hanging out with local dreadlocked Thais. The beach is a little rocky but still nice too. The crowd is young, but unlike Ko Phi Phi, the atmosphere is mellow. Tonsai has lots of cheap bungalows but like everywhere is going mainstream rather quickly. As with all beaches on the Railay Peninsula, the only way to get to it from the mainland is by boat. Read the section above to see details on that. Tonsai is cut off from the other beaches on the Railay Peninsula, but at low tide, you can walk around the rocks or there is an hour-long jungle route if it is high tide. It’s simpler to take a boat though. 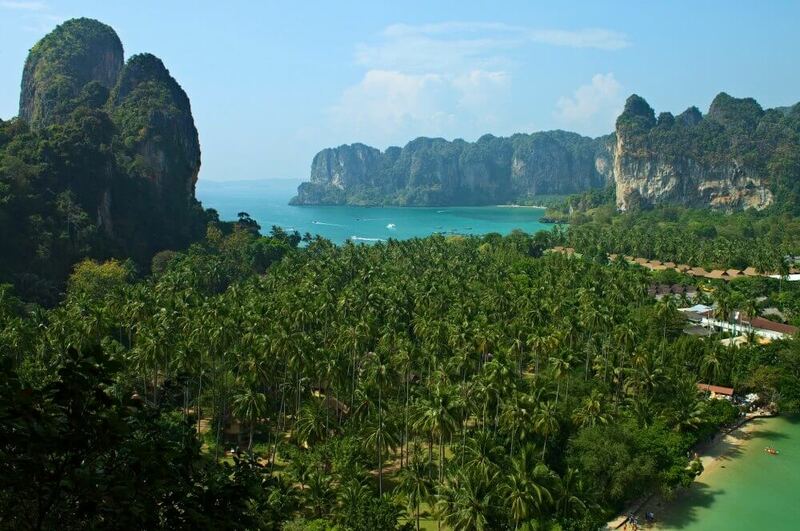 Railay West is a beautiful beach of white sand and shallow water and is great for swimming and sunbathing. At dusk, there is usually a game of beach volleyball and football going on and at sunset, everyone comes out with their cameras as it is simply stunning at this time. Due to the limestone cliffs at either end of the beach, this place is one of the most beautiful on earth. It is a shame that over the last 10 years the building work has turned parts of this area into a concrete jungle but hopefully there will be an initiative to replant some trees in the near future. However, despite this, Railay West Beach is still a stunning location and worth stopping off for 2 or 3 nights at least. 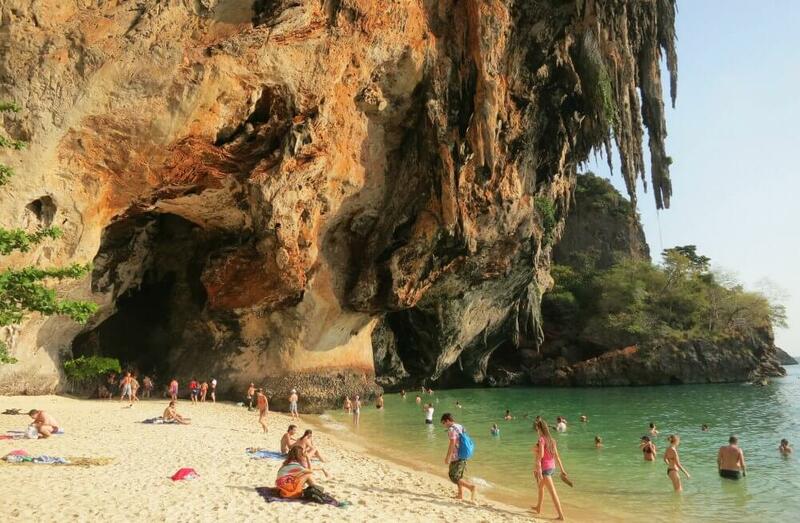 Phra Nang Beach is another wonderful beach only a 10-minute walk from Railay West/East. 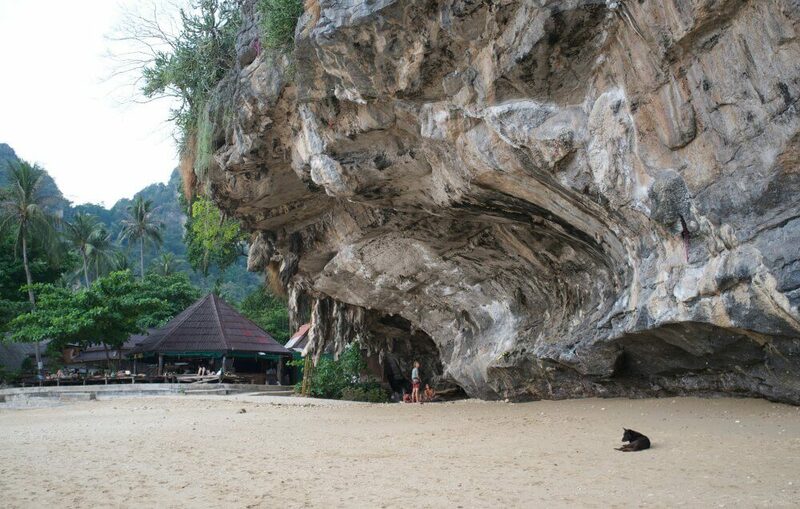 It has fine white sand, massive cliffs framing each end of the beach, and an epic cave. There is only one hotel there which is the 5-star resort of Rayawadee. It’s one of the best swimming locations in the whole of Krabi Province. Phra Nang Beach can be reached by walking to the far end of Railay East and following the footpath around. Don’t be surprised to meet lots of monkeys on the way. Phra Nang beach gets very busy every day but is not polluted by the noise of jet skis or partying as you might find in Phuket. It’s not going to be a solitary or quiet experience though, but it is totally gorgeous none the less. The cave is host to a shrine to fertility and is a unique photo opportunity in itself if you want to see dozens of giant wooden penises!! There are two words to describe Koh Jum Island. Chilled Out. Situated between Krabi Town and Ko Lanta Island (about 25kms from Krabi Town) this island has around 20 resorts that are generally basic. It also has a few chilled beach bars. The one luxury resort on this island is Koh Jum Villas. This island is developing nicely and slowly. It still has dirt roads and virtually no cars. The beaches are not pristine but are swimmable despite the rocks. A key highlight is that they are quiet and lined with hammocks courtesy of the resorts. The island’s most popular beach is Long Beach which is connected to Golden Pearl Beach. Further north is remote and rockier beaches with 4-5 low key resorts. Many islanders refer to the north of the island as ‘Koh Pu’ which is where the highest peak of the island is. Climbing this peak is a great jungle trek to embark on. Most travelers get to Koh Jum via the tourist ferries that connect Ko Lanta Island and Krabi. In less than an hour, you disembark from the big ferry onto longtail boats which take you onto the shoreline of Koh Jum. From there you wade onto the beach. The tourist ferries don’t run in low season (May-November) but you can easily get to Koh Jum by a different route. Go to Laem Kruat Pier in a blue and white songthaew (truck) from Krabi Town. It takes around 30 minutes to get to the pier and then it is a 40-minute boat ride to Koh Jum on the local ferry. The Koh Phi Phi Islands are considered to be one of the most beautiful group of islands in the world. There are six islands of Phi Phi but most are uninhabited. They lie 50km east of Phuket and 41km west of Krabi and are part of Krabi Province. Koh Phi Phi Island is overdeveloped in the area of Ton Sai Beach. The ‘village’ is full of pubs, bars, and clubs which operate into the early hours of the morning. Accommodation is expensive and resorts are cramped together. But Ton Sai Village still has its own charm and really is a great party area. If want to avoid it, there are dozens of other beaches that have an awesome secluded island feel. Koh Phi Phi has a young, party vibe. You don’t see lots of seedy bars with Thai girls as ‘hosts’, and this also adds to its attraction. Ferries leave from Phuket and Krabi every day throughout the year. There’s lots more to say about Koh Phi Phi Islands but we’ll save that for another blog. The video above should whet your appetite and show you that beauty can still be found here. Enjoy! Located 70kms from Krabi Town, Ko Lanta is a large, quiet island 6 km wide and 30 km long. It has 12 attractive beaches all along the west coast, and the west coast means great sunsets! The other coastline is mainly mangroves and fishing villages which are perfect for kayaking. The island is very peaceful with white sandy beaches, more than 60 tiny islands and many coral reefs. Koh Lanta Island is popular with both the young and the old. Local residents attend the nightlife, so it’s authentic. The 12 beaches have a massive selection of accommodation and the coastline is so long it always seems uncrowded. You can stay in a fan aired bungalow for less than £10 a night or stay in a 5-star resort for £500 a night. It’s a honeymoon location, a retreat, an excellent diving location and a place to generally hang out and enjoy. The nearest airports are Krabi or slightly further away, Phuket which both have road and boat connections. Most 5 star resorts will pick you up from the airport and transport you to your resort. Tourist ferries run November to April so in low season a minivan is your better option.